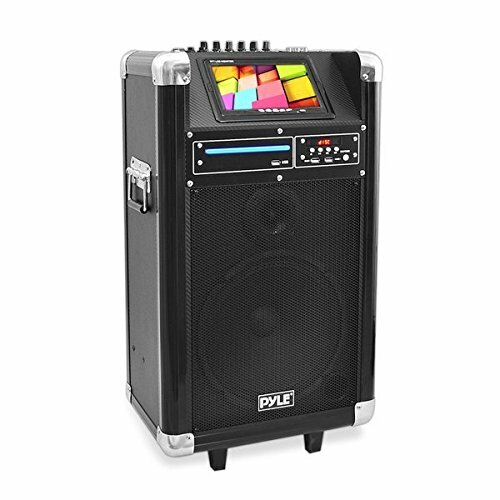 The Pyle Karaoke Vibe is an awesome multimedia entertainment system. It combines audio, video and high power output to get the party going. You can start a karaoke party, or move it to another location, thanks to features like Bluetooth for wireless music streaming, built-in rechargeable battery, VHF wireless microphone, retractable carry handle and rolling caster wheels. The Karaoke Vibe will bring the fun for everyone with additional features including 7" digital screen with built-in DVD player, 10" subwoofer, 3" tweeter all to create an immersive audio and video experience. Play it all! You can play music from USB flash drives or SD memory cards so your friends can bring their own music to the party. It's perfect for any friendly gathering or full blown DJ party. Throw a party your guests will remember and make them feel the Karaoke Vibe NOTE: Remote and microphone are included. It is located on the bottom side of the Styrofoam in the box.